When I lived in an enormous apartment building in New York City (a mere month ago), I knew only one of my neighbors. Just one of those New York things, I guess; when you live in a city with 8 million others, it’s far too daunting to try and get to know everyone, so, instead, nobody gets to know anyone. Neighborliness is too exhausting when you live in a building of thousands, you know? At any rate, my one New York neighbor was named Mike. He owned a big dog and a nice collection of shoes, and I’m fairly certain he thought my sister and I were a sweet young lesbian couple who lived three doors down and often wore matching workout gear. Since I’ve moved to San Francisco, I’ve already met two of my neighbors. There’s Chris, who lives next door — we met when I was walking out of my apartment and he was walking into his. It was clear we were both in respective hurries, so we said quick hellos and then did an awkward shuffle around each other in our small hallway; it was nice. I didn’t. Being his keys and all, I didn’t, you know, have them. We both froze, wide-eyed. We were in the back staircase, locked out of the apartment building after illegally using the washing machine. We made Mr. Bean look like Jason Bourne. Thank goodness for Jen. Once we figured out we could descend the back staircase and run around to the front of the building, we timidly rang her buzzer. (We rang Chris’ buzzer first, but alas, no answer). A puzzled “hello?” echoed from the speaker box, and Ben and I started rambling. Um, yes, hi, you don’t know us, but we’re your neighbors, we promise, and we sort of, kind of, I mean, were in the laundry room and left our keys there and seem to be locked out of the building and could you please, please find it in your heart to buzz us in? We’re totally legit, honest… we’re just, um, idiots. Finally, that gorgeous buzzing sound. We sighed gratefully and eagerly pushed the heavy door open — we’d made it. True, not a great way to meet a neighbor, but still, it counts. To prove that we aren’t total miscreants, Ben and I left a note and some banana bread outside Jen’s door, a neighborly way of thanking her for heroically rescuing us in our hour of late-night-laundry-lockout need. We’ve not yet met, Jen and I, face-to-face, but I’m hoping it’s all water-under-the-bridge between us neighbors. 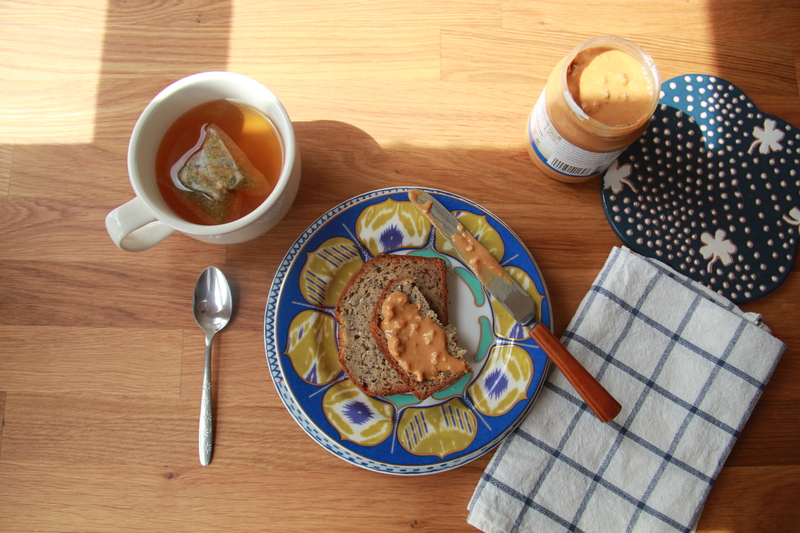 Banana bread fixes everything, right? …Right, Jen from 304? 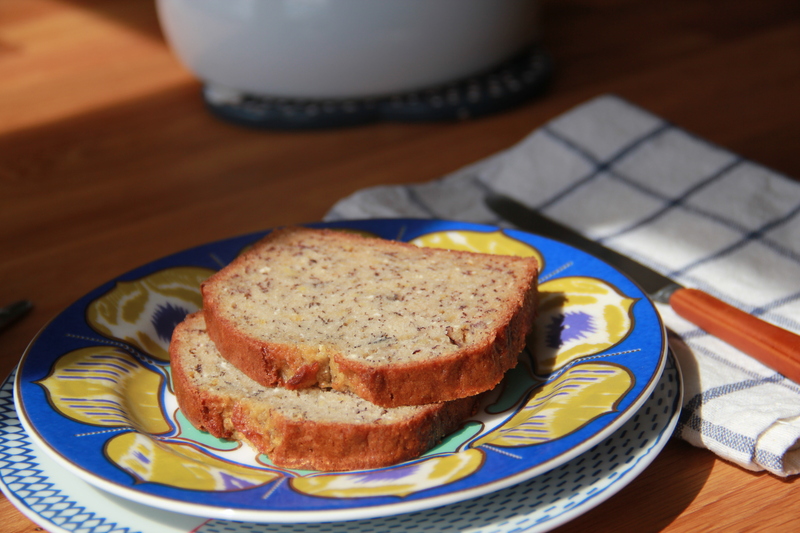 I’ll be honest – this banana bread is very good, but it’s not truly great. 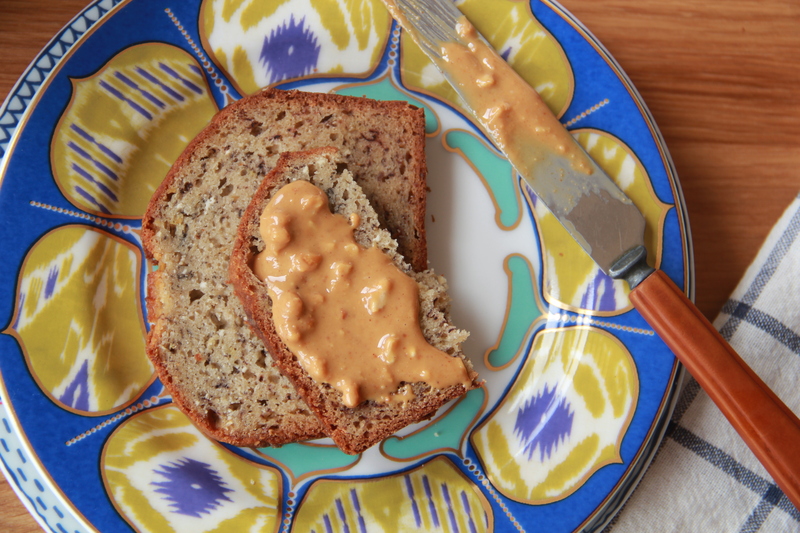 I’m still on the lookout for a real banana bread stunner, but until I find it, this one is pretty damn sufficient. I’ve found it’s flavor improves with time; it gets better after a few well-wrapped days on the countertop. Preheat the oven to 350 degrees F. Butter and flour a standard-sized loaf pan and set aside. In a small pan, heat the butter until fully melted, and set aside to cool. In a medium sized bowl, rub the sugar and lemon zest together with the tips of your fingers to release the oils in the zest, until the sugar is tinted the slightest shade of yellow. Add the flour, baking soda, salt and nutmeg and whisk to combine. In a large bowl, combine the mashed banana with the melted butter, eggs, ricotta and vanilla and whisk thoroughly until combined and lump-free. Add the dry ingredients, all at once, to the bowl with the wet ingredients, and use a rubber spatula to gently stir the batter together. Stir just until the batter is streak-free — don’t overmix the batter, lest you like chewy, tough bread. Pour the batter into your prepared pan, and bake until a skewer inserted into the center of the cake comes out clean, about 1 hour. Cool the bread in the pan on a wire rack for 5 minutes, and then invert the cake from the pan and cool to room temperature. Banana bread keeps for about 5 days well-wrapped at room temperature, and also freezes well, when wrapped tightly in both plastic wrap and tin foil. Makes 1 loaf cake, for about 8 servings. Just saying, Molls, but this is the first chapter of your book. I won’t give away the rest, although I still think that it would work quite nicely in a large building in NYC (or even Brooklyn). Couldn’t help but smile when reading about your laundry escapades. Your neighbour is a lucky lady! 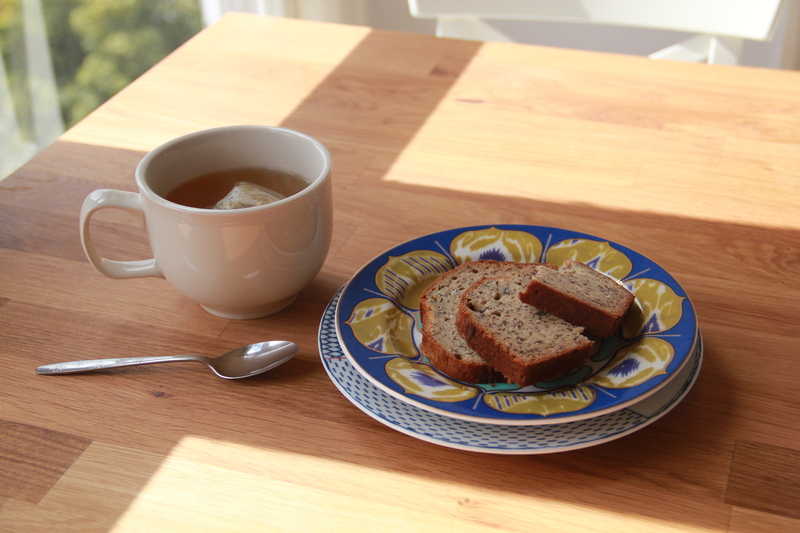 I love lemon and banana bread! can you add chocolate chips when you send a batch my way? I was looking for a variation of pound cake and found you. May I ask who Ben is? Oh, Ben? Just the man of my dreams. Glad you found me, welcome! but i put nuts…because I like ’em.